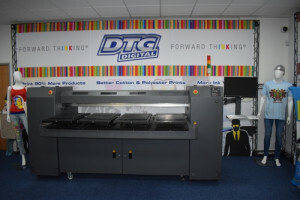 DTG Digital released the new QM8 DTG printer, which supplements and compliments the M-series range. This printer is now in to the central DTG Europe demonstration facility based in Mansfield Nottinghamshire, UK and will be shown at Printwear and Promotion Live! 2019 in January. The new DTG-QM8 is a high-speed industrial production ready textile printer. It delivers sharp colours and clarity, whilst providing a greener solution. An enhanced eight-colour ink range delivers an extended colour gamut over four heads, great hand and light-fastness to all-natural fibres, 100% polyester and blends, and has been successful with applications for cut piece textile and even full hide-leather digital printing. The printer reaches speeds up to four printed products in just over 30 seconds, which works out at upwards of 300+ pieces per hour. DTG Digital will also show the QM8 to the EU Market at other upcoming 2019 trade shows such as C-Print and Fespa show.